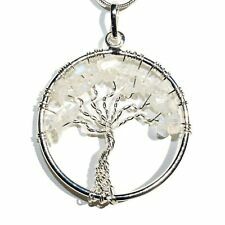 Pendant Necklace Natural Gemstone Tree of Life 7 Chakra Healing Crystal Charm . Shipped with USPS First Class Package. CHARGED Premium Amplifier Quartz Crystal Chip Necklace + 18" REIKI WOW!!! ZENERGY GEMS™!". It can both draw and send energy. Quartz works with all the chakras for balancing, cleansing and healing and is used to amplify both body energy and thought. The natural tendency for quartz is for harmony and is considered the "stone of power". Beautiful 7 Chakra Tree of Life made of Natural Stones with 14K Gold Plated on Brass Necklace and 14K Gold Plated on Brass Beaded Chain! Clear Quartz: Clear quartz is a crown chakra stone. It promotes heightened spiritual awareness, expands consciousness, amplifies energy, encourages clarity, stimulates the nervous system and is good for growth of hair and fingernails. Tree of life necklace sterling silver. Shipped with USPS First Class Package. 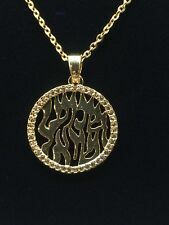 Hebrew Jewish pray The tree of life style is a symbol of a fresh start on life, positive energy, good health and a bright future. This is a starling silver three of life necklace. It’s pre owned but in good condition. I sincerely appreciate you. Lapis Lazuli is a'shield stone'. When we wear lapis, we perceive and learn many things. usually about ourselves. It is a 5th chakra stone and energizes and unblocks this chakra. Tree of life rose quartz stone pendant with cord. Orders with multiple items will be calculated after initial payment and a partial refund on shipping will be issued based on actual shipping cost. The whole length of the pendant 52-68mm, Width 12-18mm, Pendant hole 4mm. Color may very slightly due to the lighting and the flash used in the photography or enlarging the photo or settings of computer monitors. I hope you enjoy this piece. 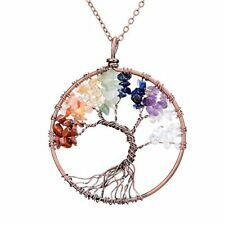 New ListingAmethyst Copper Tree of Life Pendant 2" x 2"
Brand new item. Make me an offer today. Here is a sleek Black Obsidian arrowhead stone, with a tiny Tree of Life on top. All wire work is made put of pure copper. Very nice real stone or crystal pendants. The green one may be jade, I am not sure. They are all real stone. One has a tree of life silver tone accessory. Very nice group of amazing Earth stones! PREMIUM Grade Stimulates & Adjusts Chi (Energy) Flow! Tree of life stone pendant with cord. Orders with multiple items will be calculated after initial payment and a partial refund on shipping will be issued based on actual shipping cost. Handmade Tree of Life pendant. • Adjustable chain up to 32in. Nice brownish-red stones "leaves" for fall. Stainless steel pendant, chain, and wire. This piece has a turquoise stone in the middle of a wood grained silver wire setting. Wrapped in all silver with two trees of life with both a quartz and a small amethyst stone infused in between the two trees. Vtg Heart Shaped TREE OF LIFE Pendant Amethyst Quartz Stones 36” 925 Silver Chain. Condition is Pre-owned. Shipped with USPS First Class Package. I’ve had this pendant for a long time. I’ve added the long chain. Actually it is 2 chains put together. So you can easily shorten it if you prefer. Neat necklace! A pretty pendant in the form of the tree of life. Gemstones are authentic and the wires wrapped around pendant are vermeil [gold plated]. The length of the chain is 34 inches with a 2.5 extender. The size of the pendant is from the bail, 2 and 1/8 inches and across it is 1 and 7/8. Any questions please email me. Thank you for browsing. tree of life necklace, Heart Shaped, sterling silver W brown Green Purple Stones. Shipped with USPS First Class Package. Tree of life opalite stone pendant with cord. Orders with multiple items will be calculated after initial payment and a partial refund on shipping will be issued based on actual shipping cost. Tree of life tigers eye stone pendant with cord. Orders with multiple items will be calculated after initial payment and a partial refund on shipping will be issued based on actual shipping cost. 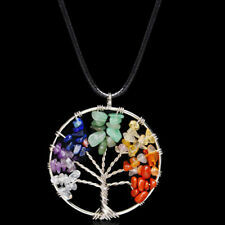 7 Chakra Tree of Life silver Pendant. Symbol of beauty, health, good luck, and healing. It is a great gift for your best friend, significant other, or anyone who enjoys handmade fine jewelry. A simple Tree of Life necklace can keep you inspired and encouraged, help you find strength and stability. Wire wrapped Amethyst Tree Of Life pendant. Each pendant is hand made & unique in design. The whole length of the pendant 52-68mm, Width 12-18mm, Pendant hole 4mm. Size and length are approximate but usually very close. Color may very slightly due to the lighting and the flash used in the photography or enlarging the photo or settings of computer monitors. New! Tree Of Life Natural Gemstone Necklace. Quart, Rose Quartz or Aventurine. New! Tree Of Life Natural Gemstone Necklace. Quart, Rose Quartz or Aventurine. Please Indicate to seller which color you want. Condition is New with tags. Shipped with USPS First Class Package. PREMIUM Grade Helps w/ Ambition, Confidence, Happiness! CHARGED Premium Malachite Crystal Chip 18" Necklace Healing Energy REIKI WOW!!! Amethyst Copper Tree of Life Pendant 2" x 2"